Expedition 39, now a six-member crew, talks to family and mission officials moments after entering the space station for the first time on March 27, 2014. This story was updated at 11:25 p.m. EDT. Three new crewmembers have finally made it to the International Space Station, two days later than originally planned. A Russian Soyuz spacecraft carrying NASA astronaut Steve Swanson and cosmonauts Alexander Skvortsov and Oleg Artemyev docked with the orbiting lab at 7:53 p.m. EDT (2353 GMT) Thursday (March 27), as the two spacecraft cruised over southern Brazil. The hatch linking the two vehicles opened at 10:35 p.m. EDT Thursday, NASA officials said. All systems on the Soyuz now appear to be functioning normally, NASA officials said in an update Wednesday (March 26). The arrival of Swanson, Skvortsov and Artemyev brings the space station back up to its full complement of six crewmembers. 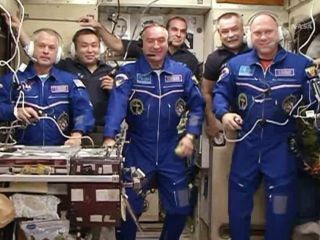 The newcomers join NASA's Rick Mastracchio, Japanese astronaut Koichi Wakata and cosmonaut Mikhail Tyurin, rounding out the current Expedition 39 aboard the orbiting lab. Mastracchio, Expedition 39 commander Wakata and Tyurin had had the $100 billion station all to themselves since March 10, when another Soyuz capsule ferried a Russian-U.S. crew back down to Earth. A Soyuz capsule carrying a NASA astronaut and two Russian cosmonauts approaches the International Space Station on March 27, 2014. Today's docking marked the beginning of Swanson's first long-duration stay aboard the International Space Station, though he has seen the inside of the complex twice before. He visited during two-week space shuttle missions, once in 2007 and again in 2009. Skvortsov has one spaceflight under his belt, staying on the station for six months back in 2010. Artemyev, on the other hand, is an orbital newbie, though he did participate in the Mars500 mock Mars mission, which isolated participants here on Earth for 17 months to simulate the stresses and rigors of an actual Red Planet mission. The space station will get another visitor soon. SpaceX aims to launch its unmanned Dragon capsule sometime next month, kicking off the company's third contracted cargo mission to the orbiting lab for NASA. SpaceX holds a $1.6 billion deal to make 12 such flights for the agency. The Dragon launch was originally scheduled for Sunday (March 30) but was pushed after a fire knocked out a key piece of the U.S. Air Force's rocket-tracking infrastructure along the East Coast. No new liftoff date had been announced as of Thursday. Soyuz flights have historically taken two days to reach the International Space Station. Mission controllers introduced the fast-track route in 2013, allowing all the required maneuvers to be completed in just six hours.